Meadowview Cottage is a luxury self-catering Cornwall cottage set in 30 acres of quiet tranquil farmland in the small hamlet of Trelash. 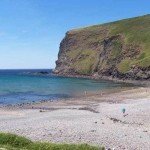 The cottage is within just 10 minutes drive of the rugged North Cornwall beaches, coastal footpaths, dramatic moorland, forestry walks and country market towns providing an abundance of exploring whether on foot, bike, horse or car. Ideally located, Meadowview Cottage is within easy reach of the A30, just 15 minutes, the Atlantic Highway less than 10 minutes and the M5 – just 60 minutes drive away. Making this luxury holiday rental ideal for exploring all that Cornwall has to offer. When you arrive in the hamlet of Trelash you will come to a crossroads. Turn right then immediately left down a short private lane. Car parking is available for up to 3 vehicles on private land adjacent to the cottage, at the end of a privately owned lane. The short lane is in very good condition with no pot holes! Ample turning space and level access to the cottage and gardens is facilitated. Debbie and Roger Bolt, owners of Meadowview Cottage, are delighted to invite guests from all over the UK and overseas to share their little corner of North Cornwall.